Idlib will not suffer the same fate as Syria’s southwestern Daraa province, vowed a Free Syrian Army (FSA) commander as a ground offensive against the last opposition-held stronghold looms. Russia is redeploying the same tactic it used against Daraa in the southwest, pointed out Major İbrahim Majbour, who commands the FSA-affiliated Free Idlib Army. “Russia wants to apply the Daraa model in Idlib, however, it will not suffer the same fate,” said Majbour, noting that Russia is currently trying to divide Idlib into five different regions through its intensified bombardment aimed at severing all links between them. Speaking exclusively to Yeni Şafak daily, the commander pointed out that while Russia does not possess any ground forces in the region, it will attempt to reach its goals through airpower backed by laying siege from the ground with the help of Iranian-backed militias. 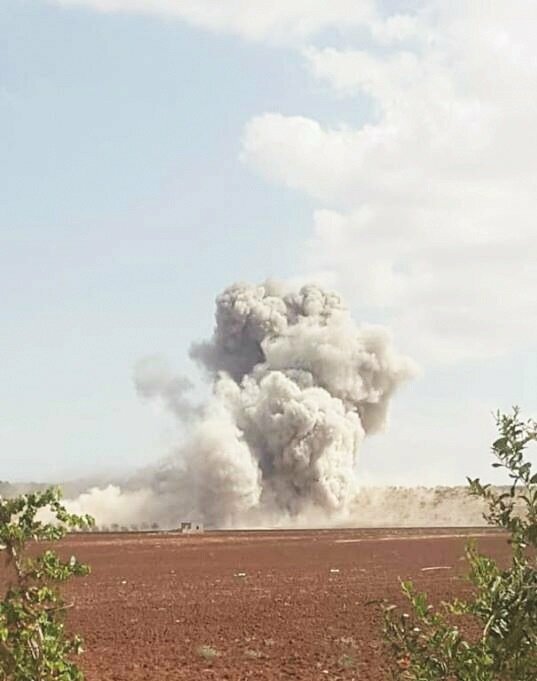 Turkey’s presidential aide on Saturday condemned a possible military offensive in Syria’s northwestern Idlib province, saying “It will bring nothing but death and destruction”.In a column titled “The Idlib quagmire is yet another test for the international system,” for Daily Sabah newspaper, Ibrahim Kalın wrote that a possible attack “will undermine all political efforts under both the Geneva and Astana processes.”The Turkish presidential aide wrote that the Syrian war continues to create “chaos, human drama, and political turmoil” in its seventh year.”‘Turkey will not watch killing in Syria from sidelines’“Without a robust and sustainable political solution, the ongoing political and military fighting will only exacerbate the current crises.“Recent developments in and around Idlib are likely to make things worse, not better,” Kalın added.Kalın’s article came a day after Turkish President Recep Tayyip Erdoğan discussed with his Russian and Iranian counterparts in Tehran the joint efforts as part of the Astana peace process and political efforts for finding a lasting solution to the Syrian conflict.Speaking at the joint news conference with Putin and Rouhani, Erdoğan called for an end to deaths in Syria.UK envoy says 'more babies’ than 'terrorists' in IdlibMigrationAccording to Kalın, the Syrian war is “certainly not fought to help the Syrian people”.“A solution based on reason, virtue and compassion would have been possible a long time ago if the stakeholders had a different approach,” he said.“The two processes of Geneva and Astana have produced some results but neither has been able to stop the ongoing carnage.“The Americans have used Daesh as a pretext to justify their presence in northeast Syria. With the Daesh threat largely eliminated, they are looking for ways to legitimate their engagement with the PKK in Syria in grave violation of the strategic partnership and relationship between Turkey and the U.S.UN echoes Erdoğan, fears potential catastrophe in Idlib“Turkey's calls on the U.S. to stop this shady relationship have fallen on deaf ears. The regime and its backers, i.e., Iran and Russia, have also used the Daesh monster to justify their policies of drawing a new map in the Levant. They all have destroyed or weakened the moderate Syrian opposition groups both militarily and politically,” he added.Kalın reiterated that any attack on Idlib where around 3.5 million people live, “will lead to a major humanitarian catastrophe.”“It will trigger another wave of migration into Turkey and from there to Europe and elsewhere,” he added.Political solution“It will be an immoral victory for the Assad regime. It will once again show that the only way to get what you want in Syria is to use indiscriminate and brutal force. This cannot be the way to resolve the Syrian conflict,” the presidential aide said.The Assad regime recently announced plans to launch a major military offensive in the northwestern province of Idlib, which is controlled by various armed opposition groups.Kalın reminded that Idlib is a de-escalation zone under the Astana agreement and Turkey, Russia and Iran established military posts in the province as the guarantor countries.“Turkey has 12 of them,” Kalın said: “The presence of Turkish soldiers there is probably the only guarantee to prevent any major assault because the Russian jet fighters and the regime ground forces cannot afford attacks while Turkish soldiers are there; we know that they do not care about civilians and legitimate, moderate opposition forces. Any attack on Idlib in the name of eliminating terrorist groups would undermine the Astana process,” he added.Kalın said Turkey has done its utmost and will continue its tireless efforts to prevent another humanitarian catastrophe in Syria.“International support must go beyond statements of concern or ‘anger,’ as U.S. President Donald Trump tweeted. It must be translated into concrete action for both a political solution and a plan for the refugees.“Idlib is a ticking bomb. We can turn it off and start a new process in Syria if the international community gets serious about the Syrian war and shows that they do care about the Syrian people,” he added. Turkey will not watch the killing of tens of thousands of innocent people in Syria to further the regime’s interests, Turkey’s president said Friday.In a Twitter message in Turkish, English, Russian and Arabic, Recep Tayyip Erdoğan said Turkey would neither watch from the sidelines nor participate in such a game "if the world turns a blind eye to the killing of tens of thousands of innocent people [in Syria]”.Erdogan's remarks came after his meeting Friday with Russian President Vladimir Putin and Iranian President Hassan Rouhani in the Iranian capital Tehran to discuss joint efforts as part of the Astana peace process and political efforts for finding a lasting solution to the Syrian conflict.Erdogan said Turkey has been trying to stop the bloodshed in Syria since the crisis broke out. "Without discrimination, we rushed to the help of our Syrian brothers and sisters. Today, as in the past, we do not [want] any of our Syrian brothers or sisters to suffer – even from a nosebleed," he said.Erdogan said the importance Turkey attaches to Friday’s trilateral summit "reflects Turkey’s care for the future of our Syrian brothers and sisters".Turkey clearly stated during the Tehran meeting that resorting to methods that disregard civilian lives "would only play into the hands of terrorists," Erdogan said.Erdogan said the Idlib issue must be resolved in line with the Astana process and without giving rise to pain, new tensions or more suffering. "Upholding the principles on which we agreed in Astana is key to finding a sustainable political solution to the Syrian crisis as well. "Warning against any faits accomplis under the pretext of fighting terrorism, Erdogan said resisting separatist efforts that seek to undermine Syria’s territorial integrity and the national security of neighboring countries was crucial.He emphasized that Turkey hosts more than 3.5 million Syrians and vowed that Turkey would continue to strive for the voluntary and safe repatriation of refugees and a lasting solution which will create a common ground for all parties to the Syrian dispute. Noting the dissimilarities between Idlib and Daraa from geographic and strategic standpoints, Majbour revealed that the opposition has prepared a three-phase plan to defend the region. “There are very different developments in store for them in Idlib, we have surprises prepared for the regime and its allies,” said Majbour. 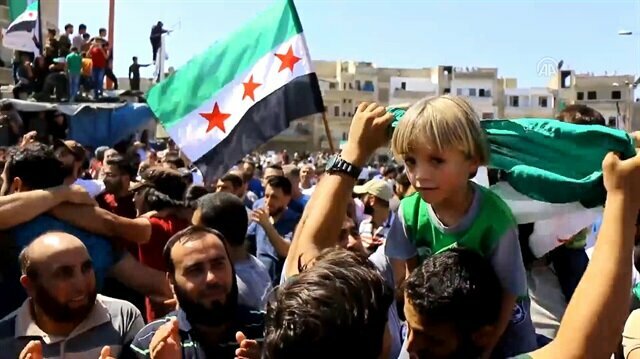 Hundreds of thousands of civilians took to the streets across Idlib in opposition to the planned invasion. Waving Turkish flags, demonstrators in a large number of towns of Idlib called for Turkish troops to enter the region, shouting anti-regime slogans and decrying Russian and Iranian actions. 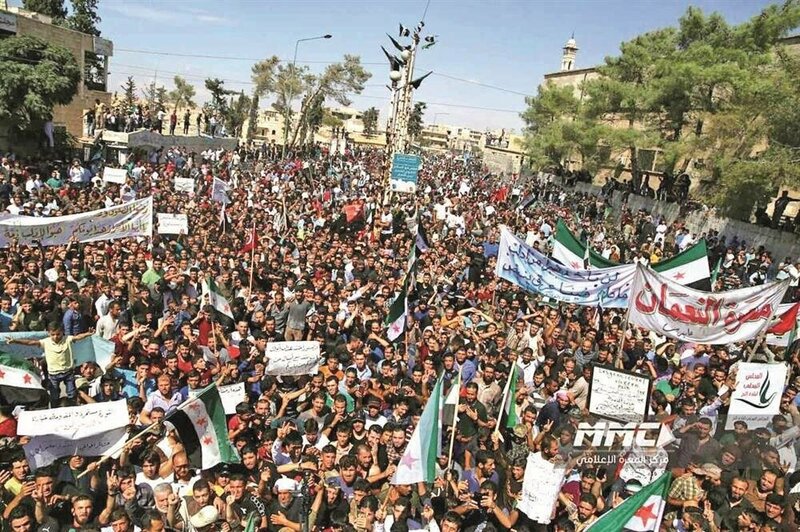 The biggest demonstrations were held in central Idlib, Taftanaz, Kafranbel and Maaret al-Numan. 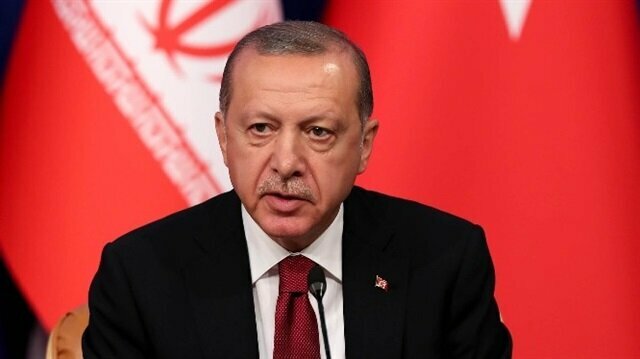 Turkish President Recep Tayyip Erdoğan called for the end to deaths in Syria at the trilateral summit in the Iranian capital Tehran. “We cannot leave this region to the mercy of the Assad regime, whose massacres against its own people are burnt into our memories,” he said. A civilian exodus fleeing Russia and the Assad regime’s latest aerial bombardment has already begun as thousands poured toward the Turkish border. 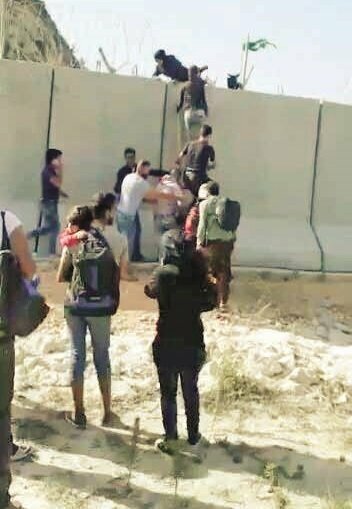 With the threat of an impending massacre in Idlib looming closer every day, panicked civilians climbed concrete barriers set up by Turkey to jump across the border. 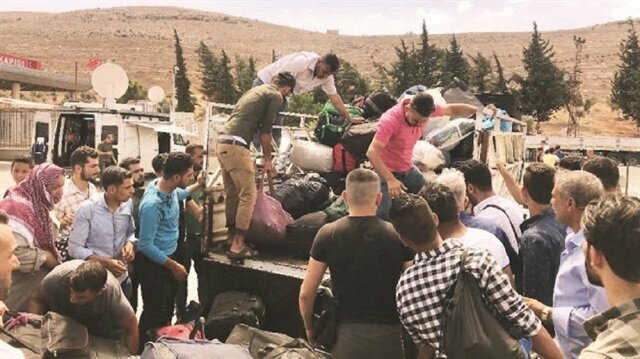 Carrying only a few items with them, Syrians crossed the security wall and sought refuge in Hatay’s Altınözü district across the border. 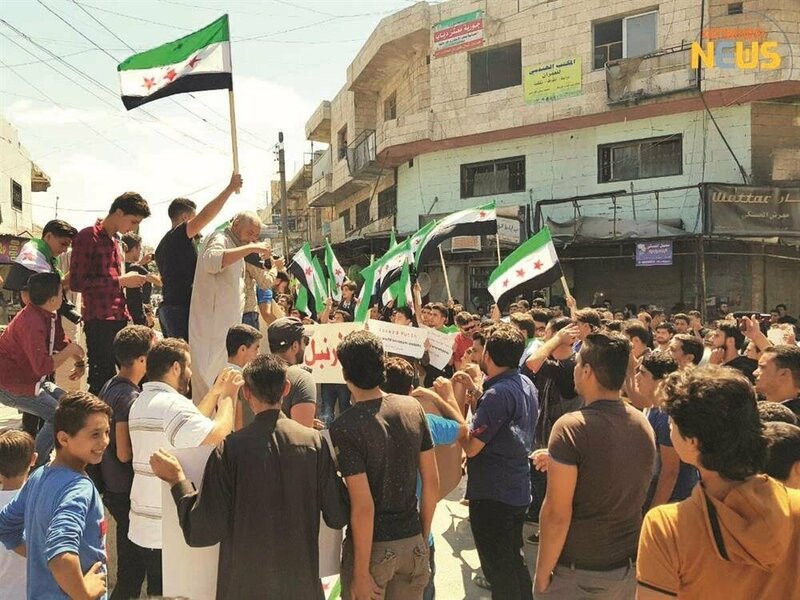 Syrian people hold an anti-regime protest in Idlib, where Bashar Al-Assad and his allies are expected to conduct an operation, on September 07, 2018. Majbour added that their respect for Turkey’s diplomatic efforts is the sole reason they have not mounted any attack up to this point, noting that as soon as battle breaks out, the opposition would overrun Latakia, Hama and Aleppo. Syrian opposition sources said that Russian military aircraft -- flying out of the Hmeimim airbase -- had carried out at least 20 separate attack sorties in recent days. On Tuesday, regime mortar and artillery fire targeted the Idlib town of Jisr al-Shughour and the northern Hama town of Haysh following Russian airstrikes against the region, where close to 4 million Syrians, the majority of whom are internally displaced, had sought refuge after fleeing violence raging in other parts of the war-torn country. Russian strikes had killed nine civilians -- including five children -- in Jisr al-Shughur, while leaving at least 20 more people injured. On Tuesday night, Russian Defense Ministry spokesman Igor Konashenkov confirmed the attack, saying Russia's Hmeymim Airbase in Syria destroyed two drones with surface-to-air missiles.